Mary Findlay, AUSA DuPont-Steilacoom Subchapter (she passed away a few months ago and her award will be presented to her daughter). Mary was nominated for her work not only with AUSA but for her program she founded in 2012, Suits for Service Members. She was nominated by Holly Constantine with the AUSA DuPont-Steilacoom Subchapter. "Mary felt a need to help all soldiers as they were preparing to enter the civilian work force. As of January 2019, Mary provided over 7,000 suits to these servicemembers. She truly (was) an exceptional woman," said Constantine. Victoria Okuly, Team Red, White, & Blue - JBLM Chapter. Victoria was nominated for her work volunteering as the Athletic Director for Team RWB. She has been a volunteer there for over two years and supports their work on planning activities for veterans and their families. She was nominated by Scott Whisler with Team Red, White, & Blue JBLM. "Victoria has been a volunteer leader with our team for two years. During that time, she's shown dedication and compassion for others while on her own growth journey." Meilyn Ruff, Fisher House JBLM. Meilyn was nominated for her exceptional work in helping families during difficult times while they stay at the Fisher House. She is the assistant manager there and also serves as their Volunteer and Event Coordinator. She was nominated by Pamela Barrington with Fisher House JBLM. "Meilyn is an exceptionally caring person. She has a wonderful ability to make people smile even at the worst of times. Without her, Fisher House would not be the wonderful place that it is today." 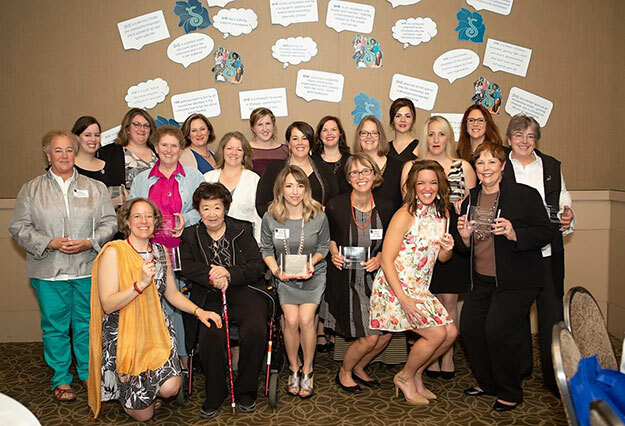 Soroptimist International of Olympia is an international volunteer nonprofit organization of service and community-minded women whose purpose is to improve the lives of women and girls through programs leading to social and economic empowerment. Soroptimist International of Olympia have many programs to assist this effort locally and globally including the funding of educational awards and scholarships for women, sponsoring girls to attend S.T.E.M. workshops and programs, supporting programs for children in foster care, assisting in anti-human trafficking efforts, and assisting women in economic crisis in form of employment-related group mentoring. For more information about Soroptimist International of Olympia, email: siolympia@soroptimist.net or visit their website: soroptimistolympia.org.